A full, supple face is synonymous with youth. A full, supple face is synonymous with youth. There are several methods for restoring a fuller contour to the face. Among them is the facial fat transfer, a surgical and more permanent alternative to dermal facial injectables or dermal fillers. This method of facial revolumizing uses your body’s natural fat to permanently store volume to the face. WHO IS A CANDIDATE FOR FACIAL REVOLUMIZING FAT TRANSFER? Ideal facial fat transfer candidates are those patients who have lost facial volume due to aging or illness. Many candidates have had facial fillers in the past but desire a more permanent solution. Candidates need to have fat elsewhere on their body. These fat deposits are extracted through liposuction and purified before being re-injected into the face. Dr. Kim uses liposuction to make small incisions and remove fat from the hips, inner and outer thighs, or abdomen. Liposuction can be performed under local with sedation or general anesthesia. Dr. Kim then purifies this fat to use as a natural, safe injectable alternative to re-create facial volume. Many areas of the face can be addressed with fat transfers, including tear troughs, temples and cheeks. 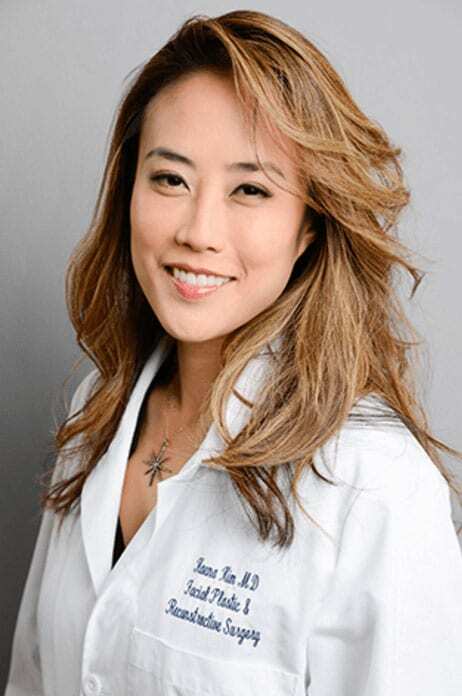 Often times, for best results Dr. Kim recommends combing a fat transfer with a facelift. WHAT IS THE RECOVERY PROCESS FROM FACIAL FAT TRANSFER SURGERY? Facial fat transfer involves minimal downtime and patients may return to normal activity within 5-7 days. Facial swelling and bruising at the injection and transfer sites is common and bruising can take between 7-10 to dissipate. There is an overly full, taut look for several weeks following the procedure, and this is intentional since some of the fat gets reabsorbed back into the body during the healing process. The area where the fat was extracted from will be bandaged and may be sore for a few days. The face heals quickly and results will become very apparent quickly over time. Dr. Kim’s patients are always very happy with their results.